interpolator_t lets you pass the interpolator function as a pointer. Add a new sampled data point. If there is an existing sample with the same X value, the Y for that sample will be replaced. Add a new sampled data point. If there is an existing sample with the same X value, the Y for that sample will be replaced. This overload lets you specify the without first constructing a sample_t. Modifies the extant samples by visiting each one and replacing the the Y in the sample with the return value from the operation. The operation must take a sample_t as a parameter. Returns the last sample or an undefined value if there are none. Produce output by combining this with rhs according to op on a point by point basis. All sampled data points in both splines are considered. The operation is applied to each pair of points existing in either spline. Points missing in one are interpolated so as to be able to combine them with the other to produce the output. Compute the second derivative of the interpolation functions and store them in the s_ member of the info associated with every x/y pair. Create a collection of interpolated values. Output those values through an iterator that points to a pair<X,Y> where X, and Y are assignment compatible with double. 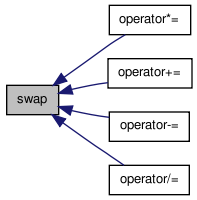 The begin,end variables define the standard output iterator range logic. The first value output will be (start_x, f(start_x)), the second will be (start_x+delta_x, f(start_x+delta_x)), and so forth. Returns the first sample or an undefined value if there are none. Ensures that all samples in rhs also appear in this sampled function. Samples in rhs superceed samples already in the spline. 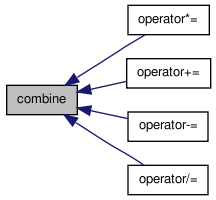 rhs can be of a different type of data structure but the structure's iterator must point to pairs whose First and Second types are compatible with X and Y. Ensures that all samples in iterator range also appear in this sampled function. Samples in the range l-g replace samples already spline. Add another spline to this one. Make sure that all samples in both splines are addressed. Quickly swap the contents of this spline with that of another. This occaisionally useful when writing algorithms that construct objects and then destruct them. You can arrange to have an empty object destructed quickly while your constructed object gets filled without a copy. This of course requires thought. A spline is an approximation to a single valued function of one variable. The function is approximated by first defining a specific set of sample values. Other data points of the function are interpolated given the defined set. That is, you can approximate data points that don't really exist using one the interpolate_* methods or the function call operator. See below. You can select which one this is using the constructor or using the set_interpolator() method. You can also call any desired interpolator directly without using set_interpolator(). A 'sample' is a pair<X,Y>. For a given X, only one Y can be used. X means 'independent variable' and Y means 'dependent variable'. That is, X is the domain of a two dimensional graph point. Y is the range. The template parameter, D, lets you specify the data type to use when doing multiplications and divisions and repeated operations. Normally, your X and Y will be one of: int, float, double, short, etc. Using double as the default high resolution numeric data type works fine for them. It isn't used much anyway. However, if you supply your own user defined classes for X or Y, you may need to supply your own D class as well. Of course, you may not need to, but the feature is there if you need it. Step function approach. The values between explicitly defined values of the X are assumed to be the same value as the explitly defined variable to the left. The exceptions being: If no data points are assumed the interpolated variable is undefined. If the requested X is before the first defined value, then the interpolated Y variable will be the same as the first Y. Linear function approach. In this approach, interpolation requests for X values between extant samples will be linearly interpolated. For variables of X higher than the highest extant sample, the line connecting the last two samples will be extended. For X requests lower than the first X, the line connecting the first two points will be extended. When only one real sample is defined, that value will be returned by the interpolator regardless of the X specified. Numerical Computing by Shampine and Allen. Copyright 1973.
y is now somewhere between 13 and twenty, given the current interpolator. Only one sample with a given X value will be kept. If you add a new sample at an old location, the old one will be replaced. Samples are stored in order, sorted by X. Use method 'domain()' to get a list of all Xs found in samples in this function. You can use the apply method to apply an operation to all the actual sample data points. This lets you change them if you like. The 'include' method lets add multiple samples in one operation -- there a couple of variations. The operators, +=, -=, *=, and /= let you include combine two splines by interpolating this spline and another spline over all datapoints of interest to either spline, and producing a new spline. The interpolation involved in these operator functions is the 'current' interpolator set using set_interpolator() or as a parameter to the constructor. 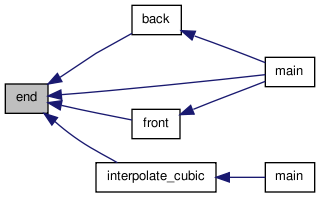 Comments about the spline members can be found in the bodies thereof which begin immediately after the class definition. Definition at line 55 of file spline.h. Definition at line 192 of file spline.h. Definition at line 169 of file spline.h. Definition at line 195 of file spline.h. Definition at line 191 of file spline.h. Definition at line 189 of file spline.h. Definition at line 188 of file spline.h. Definition at line 199 of file spline.h. Definition at line 167 of file spline.h. Definition at line 168 of file spline.h. Default constructor gives you the default interpolator (stepwise). Creates an empty spline. Use add_sample to fill it. You can of course use any interpolator by calling it directly, or you can use set_interpolator to select a different one as the current interpolator. Definition at line 318 of file spline.h. Constructor that lets you specify the interpolator algorithm. Definition at line 333 of file spline.h. Definition at line 344 of file spline.h. Construct a spline from a pair of iterators to objects that look like samples. That is, a range of pair<someXtype, someYtype>. You must also specify the desired interpolator. Definition at line 357 of file spline.h. Copy an extant interpolator's data. You can specify a new interpolator. Definition at line 378 of file spline.h. Definition at line 471 of file spline.h. Definition at line 458 of file spline.h. Definition at line 820 of file spline.h. Definition at line 610 of file spline.h. Definition at line 299 of file spline.h. Definition at line 491 of file spline.h. Definition at line 972 of file spline.h. Get a set of the sampled data X components (ie the domain locations where samples are taken. Definition at line 844 of file spline.h. Definition at line 308 of file spline.h. Definition at line 944 of file spline.h. If you ask for 9, you will get end() returned. If you ask for 13, you will get an iterator to 12. If you ask for 11.5, you will get an iterator to 11. Definition at line 629 of file spline.h. Definition at line 597 of file spline.h. Definition at line 557 of file spline.h. The iterators must point to pairs of some kind but those types do not have to be exactly X and Y. On the other hand, it must be possible to convert them to X and Y respectively. Definition at line 526 of file spline.h. Definition at line 1063 of file spline.h. In this diagram, the samples are (x0,B), (x1,D), (x2,A), (x3,A), (x4,C). This is the second fastest interpolator and is usuable to represent the manufacturing of objects. Usually, an object takes a certain manufacturing time -- the more time, the more objects are made. Sales estimates generally work like this. Slowly changing real world physical phenomena can also be modeled this way. If you need more accuracy, use more samples. If there are no samples at all, you get an undefined result. Definition at line 716 of file spline.h. In this diagram, the samples are (x0,B), (x1,C), (x2,A), (x3,D). A step wise interpolator makes sense when tracking inventory and the time to load and unload trucks is insignificant. It is the fastest interpolator. The return value is calculated like this: If there are no samples, the return value is undefined. If the requested 'x' value to be interpolated is less than the lowest sampled x value, x0, then you get x0's value functional value (B). Otherwise you get the value of the actual sample data, Y component, of the sample on or to the immediate left. So at point u, you would get C, and at v you would get D.
Definition at line 663 of file spline.h. Definition at line 573 of file spline.h. Definition at line 907 of file spline.h. Definition at line 868 of file spline.h. Definition at line 887 of file spline.h. Definition at line 926 of file spline.h. Definition at line 585 of file spline.h. Definition at line 1131 of file spline.h. Definition at line 394 of file spline.h. Definition at line 205 of file spline.h. Definition at line 204 of file spline.h. Definition at line 203 of file spline.h.